Diana Brydon | Click Here. It would be difficult to deny that the Humanities are in some distress at this particular juncture of their history, and face an imposing and worrisome array of challenges — economic, political, and cultural — if they are to survive in some recognizable form into the next decade or so. The Humanities have not faced this threat quietly or complacently, but have also, I think, not been terribly effective in formulating a response. Reactions have varied, from ideologically-driven (and utterly unrealistic) demands for a simple turn-around in government funding policies and attitudes, to enthusiastically naive (or perhaps exceedingly cynical) calls for techno-utopian solutions such as MOOCs. The most promising response, I think, has been one that steers something of a middle course, and imagines ways in which a dynamic collaboration of the Public Humanities with the Digital Humanities can both revitalize our fields while at the same time answer in an effective manner the strident critiques being levelled against the Humanities from outside the academy. There a number of obstacles to be overcome if such as an approach is to succeed, as the epigraph citing Alan Liu at the head of his post suggests. But there have also been some imaginative and thoughtful attempts to negotiate such an approach, by such scholars as Liu, Julia Flanders, and others. (I’ve listed just a few in “References,” below.) This post, and a few that will follow on it, are an attempt to make a modest contribution to this task. If the Humanities are in some disarray at the moment, this in part because we have been forced onto the defensive. We have become reactive and, perhaps inevitably in that context, somewhat conservative. And having conceded the initiative, our responses have also become confused, ineffective, and often contradictory or counterproductive. Part of the problem is that I think that this is an unnatural place for the Humanities to be: ours has, historically, been an evangelical and outward-looking movement, and I don’t think we are as effective when we are instead circling the wagons. So, I am not going to deny the facts of the criticisms being levelled against the Humanities, but I am, for the most part, not going to address them directly. I do so for strategic reasons, and not because I am in denial. Another reason the Humanities are having such a difficult time marshalling an effective defence is that this assault from without coincides with the turmoil instigated by a powerful new force that is reshaping (some might say distorting) our disciplines from within. I refer, of course, to the so-called “digital turn” that is profoundly transforming not merely our fields, but our entire educational system, and indeed our very culture. To many Humanists, the advent of new computational approaches within our traditional fields seems profoundly “anti-humanist.” Others may be unable to clearly distinguish the upheaval that digital technology and approaches are bring about from the damage being done the Humanities by external forces. And indeed, we are wise to be vigilant that the digital turn, or at least its rhetoric, is not co-opted by the besiegers. Had Erasmus lived today, he might perhaps have become a Digital Humanist. He would certainly have been eager to make use of these new ways of disseminating knowledge and ideas. It would be odd, therefore, if the Humanities did not choose to exploit the power of a new technology to engage with our society, just as the Renaissance Humanists did before us. And engaging with our society, rather than with the politicians, bureaucrats, and corporatists who have taken aim against the Humanities, is precisely what I propose to do. Personally, I am tired of feeling defensive, and of fighting this battle on grounds of the enemy’s choosing. It is time to take the offensive, and, moreover, to do so by engaging directly with those who are not being consulted in this debate, the “public.” It is time to resuscitate what I have called a militant Humanities, one that proves its cultural value not merely by force of argument, but by our choice of weapons. The best response to those who claim that the Humanities have become valueless is to demonstrate how vital and important a component of our culture they actually are. We can best prove that we are dynamic and relevant by actually being dynamic and relevant, and to show that we are a vital and positive cultural force by impacting, in positive ways, upon our culture. Whom do we think we mean when we talk about about a “public” for the Humanities? By and large, academics live, I think, an existence that produces a rather odd perspective on “public.” On the one hand, our on-campus jobs, in our classrooms, seminar rooms, and offices, are in some regards already very public. We are in some sense performing before a kind of public, albeit a rarefied one, every time we teach. What this may mean is that we do not, perhaps, always have a very clear sense of what we mean by “public.” Understandably, we tend to think of the public, or at least our “public,” as comprised of people like ourselves, or like our students, except not quite so. Our public tends to look a bit like our classrooms, except that it congregates in museums and libraries and art galleries. It is generally pretty well educated, and reads a lot. And, most importantly, it is already interested in what we have to say. It likes and admires us, and is quiet and respectful when we speak. It asks intelligent questions when given the opportunity (at a time of our choosing), and doesn’t need to be told that what we are telling them is terribly, terribly important. This all sounds very cosy and intimate, and this is a good thing. Unfortunately, however, this sense of cosiness and intimacy may largely be an effect of the fact that “our” public is also terribly, terribly small. There is nothing at all wrong with reaching out to those who already wish to engage with us. But if we truly wish to communicate the values represented by the arts and humanities to those who don’t already share those values with us, we need to find new venues for engagement. And to do that, we have to be willing to step outside of our comfort zone more than just a little. So we must identify new publics, and in so doing, make note of what it is that makes each distinct. We must learn how each sees itself with the context of the larger cultural matrix, and how it might see itself in relation to the Humanities. And, in order to engage with and serve each of these new publics, we must accommodate ourselves to them in a manner that is both sensitive to them, and true to our own values. Where is “the public” to be found? This question relates in fairly obvious ways to the one above, because there is an obvious correlation between whom we address and where we find them. Or, more pertinently, where we look for them, because the size and nature of the publics we address will be a function of where we seek them out. So, where do we look for our public? There is a book, a collection of short essays, by Canadian writer Sheila Heti (with Misha Glouberman) entitled The Chairs Are Where the People Go. I’m not actually a particular fan of the book, but the title essay (which is, in fact, about arranging audiences for public lectures) might almost have been written for most academics. We tend to look for our “public” where the chairs are. And the chairs are mostly on campuses, or in libraries, or at museums. Where do the people mostly go? Well, actually, most of them don’t congregate in such places, in chairs or otherwise. They are instead in a great many other places. And an awful lot of them are, as we know, online. Social media is very often where the people go. Are we in the Humanities online, in social media, too? Well, yes, some of us, some of the time. But are we really employing the digital public sphere to engage a public, or do we mostly use it to network among ourselves? To answer that question, we all might glance over our Facebook “friends” list, or the lists of those we follow, and those who follow us, on Twitter. How many of these constitute our “public” . . . and how many are really “us”? What is it, exactly, within the Humanities that we want to “make public”? When faced with criticisms of the utility of the Humanities from the public media, it has become a reflex to speak about the importance of “critical thinking.” We tend to say this as though critical thinking was self-evidently at the heart of what we actually research about and teach (is it, really? ), and also as though critical thinking were the exclusive preserve of the Humanities — a claim that I know that those in other fields would challenge. One of our tasks then should be to interrogate what we mean by “critical thinking,” and to analyze the ways in which the particular flavour of such thinking in the Humanities differs (if indeed it does) from that offered by other fields in the sciences and social sciences. What, in other words, do we have to offer that is unique to our disciplines? Stepping back from that fundamental question, we also need to ask ourselves what it is that we actually deliver to “our” public. When we give public lectures, place our research in the public domain, or blog and tweet about what we are doing in a publicly available venue, are we really offering insights into critical thinking? Well, sometimes perhaps we do. My own perception, however, is that most often what we offer up is not an insight into humanistic modes of perception and thought, but rather what I will call, for want of a better word, “content.” By content, I mean something rather like “facts.” We lecture on the life and oeuvre of a particular poet, or talk about the evolution of an artist’s aesthetic vision, or we discuss the philosophical and ethical implications of a particular public policy. This is all good stuff, I believe, but it is for the most part communicating the fruit of our own critical thinking and research, rather than demonstrating how we think and research. It tends to be built around a narrative that we have already constructed, rather than around the power and implications of building narratives. So the question is this: if we believe (as most of us do) that it is more important that our students learn how to read (in all the multivalent senses of that word) and think critically than that they remember the dates of such and such an author or work of art, then why do we not think that this same set of intellectual priorities should apply to our non-academic public as well? If we believe (as most of us probably do) that the Humanities have a transformative power, and that they are of inestimable value to the thinking citizen of a democratic society, why do we think that we are performing an especially valuable service by lecturing on materials that we would probably relegate to secondary status in evaluation of student progress? Do we believe that our broader public is less capable of, or less interested in, learning how to think in humanistic ways than our students? Do we apply what we have come to know about teaching to our engagement with the broader public(s)? This question in some ways follows naturally upon the one immediately above. We have, as a profession, expended a fair amount of thought over the last decade or more on learning and teaching strategies. The advent of digital teaching tools and resources over that time, ranging from the homely Powerpoint slideshow to the might MOOC, has done much to change the way that we approach pedagogy, and these new resources have become, to greater or lesser degrees, an accepted part of our arsenal of teaching tools. And, because tools change what we do, and how we think about it, as much as they transform the way in which we do things, our pedagogy has changed in interesting and (mostly) positive ways. Blended learning, peer-to-peer teaching, visualizations and project-based learning are among the more important new strategies we employ because we have come to believe that they are effective ways of communicating and instilling the skills and information that we wish to impart to our students. But how many of us employ these when interacting with a public not comprised of our peers or our students? The Powerpoint (or Prezi, or Keynote) has certainly become ubiquitous, but what other tools do we use to engage with a broader public? More importantly than the technology, have we sought to introduce new and innovative strategies for engaging with such publics? Have we thought about how blended or collaborative learning, or project-based interactions might assist us in such engagements? Have we tried to empower our public, to treat them as equals in dialogue with the Academy, to learn from them as they (we hope) will learn from us? Do we listen to our public? For whom do we build? Looking beyond, for a moment, the perpetual debates within Digital Humanities about who is “in,” and what constitutes “building,” we can say truthfully that all academics “create” things, whether those things are monographs, articles, works of fiction or art, or digital tools. We create all of these things for particular audiences or communities of potential users. The classic scholarly monograph or peer-reviewed article, for instance, are invariably written for those who are like ourselves: for specialists in this or that field. Books and articles written for a popular audience — the latter might include, for instance, guest columns in a newspaper or a magazine article — are obviously produced for a larger audience, while a novel, poem, performance, or work of visual art is intended to appeal more broadly still. As for digital tools — well, I can imagine the occasional non-academic having some fun playing around with a tool like Voyant, or Orbis, for a short while. But the vast majority of our digital resources, be they research tools, or electronic editions, are produced for a highly specialized use by people who closely resemble us. Can we imagine what we might build for a different kind of audience? What sorts of tools might engage with those whom we have not already narrowly defined as peers or allies? Throughout this post, I have been writing as an academic, with a presumed audience of other academics (which I would take to include graduate students and librarians at least). Perhaps this is telling? Possibly the tendency of academics (including, evidently, myself) to think of ourselves as a very distinct group, rather than as a part of a larger community, is symptomatic of the reasons why all Humanities are not yet Public Humanities? The Humanities are a very broad and (ideally) inclusive community. We “do” the Humanities in universities and colleges, but surely we should acknowledge that we are not the sole custodians of and advocates for the many and diverse range of intellectual and creative activities that are denoted by that term. Public librarians, K-12 teachers of all sorts, artists, musicians, filmmakers, and writers, community leaders, fundraisers, and members of an enormous variety of creative, artistic, or generally humanistic ventures in the public sphere: these are all more than merely potential allies. They are, in a sense, another important facet of who we are. And establishing who we are is a vital first step in communicating the values for which we stand. Acknowledging our membership within a much larger community of practitioners of the Humanities is important for that reason if for no other. * I am aware, of course, of the dangers potentially inherent in conflating “the Humanities” with older and frankly problematic forms of “Humanism,” and I use the term “humanist” somewhat guardedly for that reason. It is possible, however, to envision a newer, more diverse and nuanced form of “Humanism” that takes into account new understanding of globalism, sexuality, identity, and the other issues that now make the older ideology seem so out-of-date and untenable. See for instance Diana Brydon’s call for a more expansive humanism in “Do The Humanities Need a New Humanism?” Centre for Globalization and Cultural Studies, Winnipeg: U of Manitoba, 2013. 4Humanities: Advocating for the Humanities. Web. Accessed 5 May, 2013. Brydon, Diana. “Do The Humanities Need a New Humanism?” Centre for Globalization and Cultural Studies, Winnipeg: U of Manitoba, 2013. Web. Accessed 5 May, 2013. Draxkler, Bridget, Jentery Sayers, Edmond Y. Chang, Peter Likarish, et al. “Democratizing Knowledge,”HASTAC, Forums, 2009. Flanders, Julia. “The Literary, the Humanistic, the Digital: Toward a Research Agenda for Digital Literary Studies.” Literary Studies in the Digital Age: An Evolving Anthology. Ed. Kenneth M. Price and Ray Siemens. MLA Commons. New York: Modern Language Association, n.d. Web. Accessed 6 May, 2013. Heti, Sheila, with Misha Glouberman. The Chairs Are Where the People Go: How To Live, Work, and Play in the City. Faber & Faber, 2011. Liu, Alan. “The State of the Digital Humanities: A Report and a Critique.” Arts and Humanities in Higher Education, 11.1 (2012): 1-34. Pettegree, Andrew. The Book in the Renaissance. New Haven and London: Yale, 2011. Image Credit: Ambrosius Holbein. 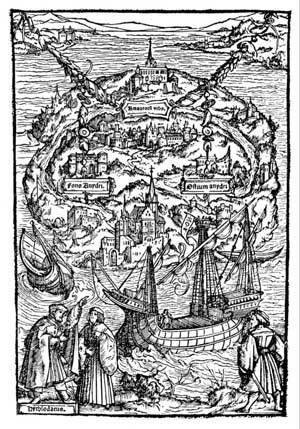 Utopiae Insulae Tabula, from Thomas More, Utopia (Basel, 1518). Wikimedia Commons.